Sorry I fell of the face of the earth in December. I am pretty sure, that if you are regular reader, you understand the craziness of the Christmas season for someone who has poor health. I concentrated the whole of December on creating Christmas gifts. I also went up to York to see my family and a consequence of this visit, was my inability to think straight for the next 3 weeks. I didn't even manage to spend a weekend with my OH's family, which I was so sad about, but couldn't face sitting in a car for 3.5 hours on the day of travel. In the end I was glad I didn't go, because that journey took my OH more like 4.5 hours which would have been hideous for me. As a result of my painful Christmas and New Year I have decided that I need to see the doctors about tinkering with my pain medication again. Whenever I have an increase in pain levels it always takes me time to adjust mentally and physically, which is why I disappeared. I'm hoping that changes in medication (when it happens) will help me quickly and not leave me too spaced out. In the meantime I will try and catch you up with the stuff I created for Christmas. I made 5 gifts, 4 of which were for children. The non-child gift was a shawl for my sister-in-law that I made earlier in the year, so I'm only going to focus on the children in this post. I used Cascade 220 Superwash for all of the children's gifts. It has become my "go to" yarn for children's knits because it is a nice bouncy yarn, that is machine washable, but is also wool so it is warm and breathable. It also comes in lots of colours and is reasonably priced. I get mine from Nutty Knitting Supplies. Firstly I made a whale for my niece, who's favourite word seems to be FISH at the moment. 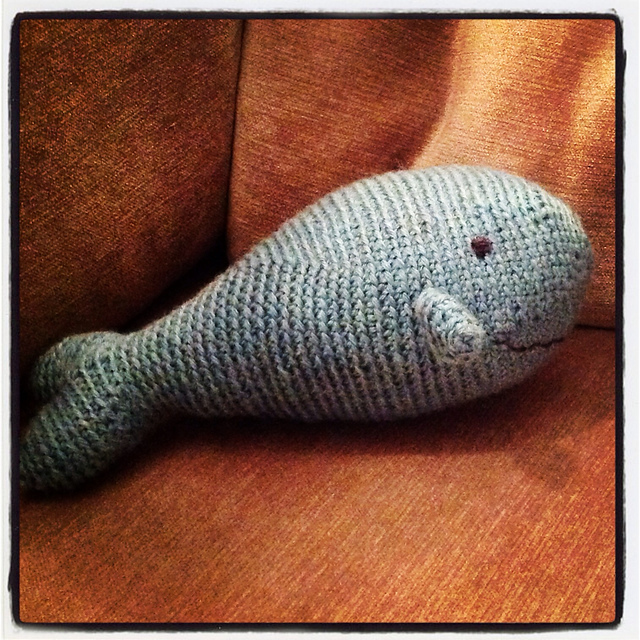 It was a crocheted whale made from a free pattern by Stacey Trock, who is my favourite amigurumi designer. The pattern is M.Richard the Whale. For nephew A, he needed more clothes as he keeps growing in spurts. 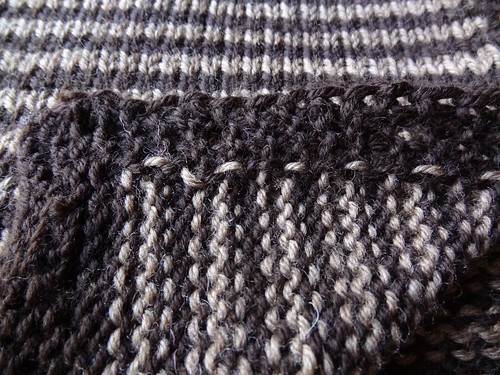 He hates having anything pulled over his head and he suits nice rich brown colours, so I decided to give him another Beyond Puerperium, but in worsted weight and with long sleeves for the colder months. Apparently it is a little big but I think that is much better than being too small, as he'll grow into it, and it means he can have layers underneath. 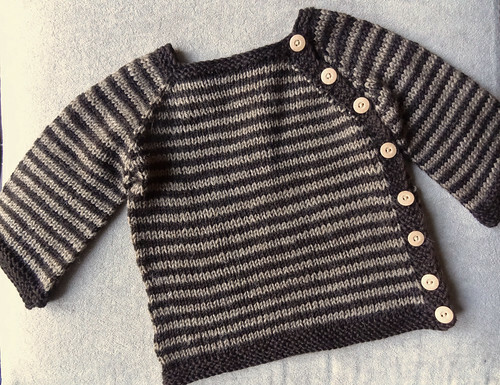 The button bands were knit simultaneously with the body of the garment, so I used intarsia to make the button band in a solid colour. The buttons are made of plastic but they go really well with the cardigan. I used embroidery thread to attach the buttons and I found a really good match in my old cross stitch thread collection. 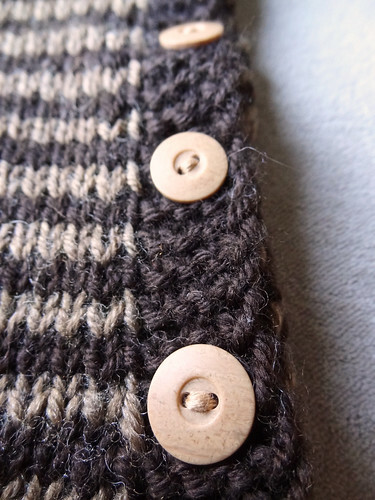 I make a shaft by wrapping the thread around several times underneath the button, but above the knitted fabric. 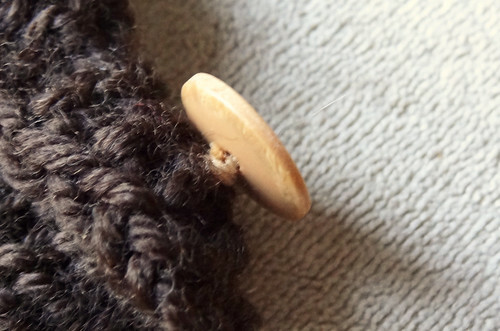 This means that the button doesn't pull the cardigan out of shape. For my other two nephews, O and K, they requested more monsters! There was discussion about colours and types and there was several mentions of Mike Wazowski from Monsters University and I had to say that there weren't any patterns for Monsters University because of licensing issues. THEN I discovered this blogpost. 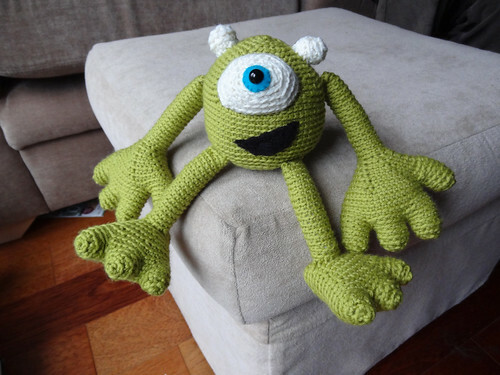 A FREE Mike Wazowski pattern from Stacey Trock. I was so pleased that I didn't have to disappoint the boys and got crocheting. It took ages to make because there were lots of fiddly bits and, in fact, this quick snap was taken on the evening before it was wrapped to be delivered. I cut very close to the wire. 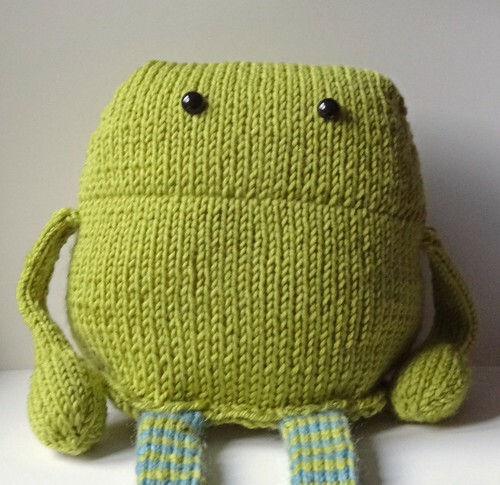 I used a safety eye instead of felt for the pupil, because I think that gives more life to crocheted creatures. I used black fleece for the mouth, because at the last minute I discovered I didn't have black felt (I'd already decided not to use it for the eye). I decided not to put the teeth in, as I like this look better. I'm really pleased with how he turned out and I was assured by my OH on his return from his family that K, loved his monster and wanted to make sure that my OH told me so. O's monster was from Big Book of Knitted Monsters by Rebecca Danger and it was the Toothy Joe the Mailbox Monster pattern that I chose this time. I decided to make my version toothless though. He looks slightly sad from this angle, but from above he looks like he smiling (honest). I love his long limbs too. 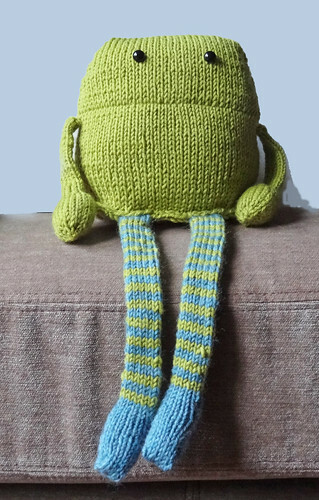 He is a perfect sitting monster, which I thought was more suitable for my eldest nephew. Again the recipient made sure to tell my OH that he loved his monster and to tell me that. They are both such polite boys as well as being great in all other ways too. I am so sorry I missed seeing them at Christmas because they are getting quite mature now, and though I'm looking forward to getting to know who they become as teenagers and adults, it makes me sad that this might be the last time O admits to wanting a monster for Christmas. He will, however, always be knit worthy as he has always loved my knitting and the knitted gifts he's received. I hope you had a great end to 2013 and I look forward to spending 2014 with you.